Subscribe for the latest industry trends, insights and more! Thank you for joining the Ropella community. In most organizations, making the right hire means the difference between success and failure. In health care it means the difference between life and death. The Right Hire was written examining the staffing process of a fictitious hospital system – Prestige Medical Center and is referenced as a continuous theme throughout this book. If the right hire has great value in a hospital system, where hiring the right person (or the wrong person for that matter) can mean the difference between life and death – how valuable is the right or wrong hire in your own organization? With this in mind, Prestige Medical Center could just as easily have been any type of organization imaginable - including your own organization. At the Ropella Group, we know from over 25 years of experience working repeatedly with many of the world’s largest chemical, high technology, consumer product, energy and health care organizations that the SMART Talent Management strategies outlined in this book can cross all boundaries. Regardless of what industry, product, market or organization you work in, where you are located globally or what functional roles you focus on hiring for. What matters is that you study the strategies of SMART Talent Management and implement the tactics, practices, forms and tools of the SMART Search System. The Right Hire will dramatically improve your ability to get the right people in place–people who are well qualified, high performing and a perfect fit for your management style, behavioral standards and culture. What is the purpose of this book? Patrick Ropella explains the purpose of his book, The Right Hire. What are the biggest obstacles companies face in hiring top talent? Patrick Ropella answers the question, What are the biggest obstacles companies face in hiring top talent? Why did you decide to write your new book, The Right Hire? Patrick Ropella answers the question, Why did you decide to write your new book, The Right Hire? Who is the audience for this book? 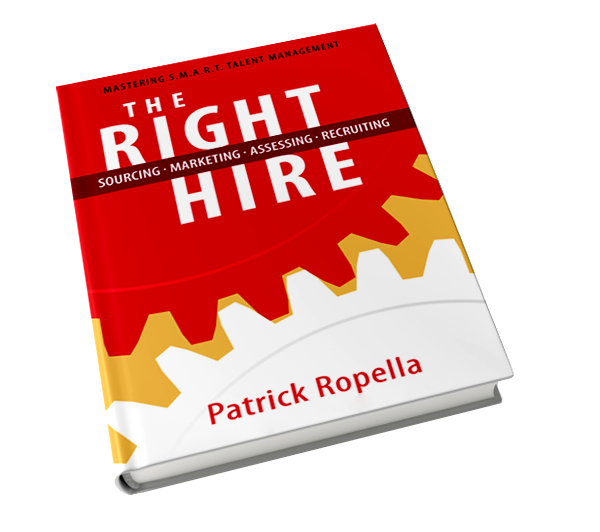 Patrick Ropella answers the question, Who is the audience for your new book, The Right Hire? What makes your book on hiring different? Patrick Ropella answers the question, What makes your new book different? The biggest benefit from this book? Patrick Ropella answers the question, What is the biggest benefit companies will receive from implementing strategies in your book, The Right Hire? What qualifies you to write this book? Patrick Ropella answers the question, What qualifies you to write your book, The Right Hire? Why should companies make the right hire? Patrick Ropella answers the question, Why should companies be so concerned about making the right hire? The Right Hire offers a great perspective on a critical topic! Using the principles and practices set forth in The Right Hire will mean the difference between success and failure. “Physician heal thyself.” This biblical mandate was never more true than today. The biggest healthcare initiative in our country’s history is underway, but it is woefully mismanaged on many levels. Patrick Ropella’s current book, The Right Hire gives us proven principles and focused strategies to identify, attract, motivate and measure talent in any field, but especially where it is needed most - the muscle-bound world of managing the deliverance and effectiveness of healthcare and wellness. If you need relief fast, read and put into practice what’s in this book. Patrick, It was nice seeing you at this year’s Soap & Detergent Association annual meeting. I look forward to sharing the Right Hire with my leadership team. Thanks again to a valued partner and Leader. People interviewing have choices, and The Right Hire presents the right things to do not only to attract the top talent, but also to assess for culture fit, personal characteristics, and experiences and credentials that will fit with your opportunity. It gives the reader the needed tools to attract, screen, assess, offer, and successfully integrate and retain top talent. With the growing need for companies to hire the very best talent available, The Right Hire is a must read. Patrick, Thank you for all that you and Ropella do for Dow. The processes and systems you have applied (from The Right Hire) while working with Dow have proved very valuable over many years of service. With over 30 years of experience in C-suite executive recruiting across industries, I would recommend this book to any organization serious about finding and hiring the best talent in the market. The Right Hire presents penetrating insights into the recruiting process along with practical tools to drive recruiting to the next level to build the best team in the business, whatever your business may be. Pat has crafted a magnificent and powerful approach to the #1 challenge of any progressive, growth-oriented business: attracting, selecting, and on-boarding top talent. His strategy, tactics, and tools brilliantly guide us on the journey to finding and retaining today’s best people. I only wish he’d written this 25 years ago when I began my career - it would have saved me hundreds of hours and thousands of dollars in my recruiting efforts and mistakes. Pretty well every successful business leader speaks to the value of the human capital in their organizations. It is startling then that there has never been a truly comprehensive business book on how to go about the process of hiring. Pat Ropella is filling a big void with The Right Hire – a must have handbook for effective hiring. Patrick Ropella’s The Right Hire provides, for an extremely sensitive subject and potentially costly area of corporate life, a light, easy-to-understand, and hugely helpful system for how to do it right the first time. This book should be standard curriculum for all managers and executive committees. Provocative. Practical. Pragmatic. Ropella spells out in a compelling way the dynamics of one of the most critical decisions any organization makes: making the right hire. This book should be required reading for all HR professionals, search consultants, and anyone involved in hiring for that matter. Too often making the right hire is seen as a matter of luck. It should not be. Follow the steps in this book and it will improve your success rate dramatically. coauthor, Ordinary Greatness: It's Where You Least Expect It...Everywhere. People are the source of every organization’s competitive advantage and Patrick has given us a proven path to finding and keeping the right people that will ensure our success. This engaging book will convince you that the most important strategic decisions you will ever make are the people you hire. Read it - absorb it - do it! Patrick possess an extraordinary ability to bring structure and systems to concepts. This is exactly what he has done in this book by providing a blueprint for any talent acquisition team. People are the most precious resource of any organization. The Right Hire provides a system that will maximize any team’s ability to not only identify and screen the ideal talent but also to attract and retain them. There are immediately implementable best practices as well as a clear and easy to follow system to win in the ongoing marketplace battle for the best and brightest! After a career spanning more than 38 years in executive search and consulting, I can say without reservation, that Patrick Popella’s, The Right Hire is without a doubt the best publication I have read on the important subject of developing and executing an effective and successful staffing process. From the easy to follow layout of the book to the support graphics; from his down to earth writing style to the realistic and practical techniques and strategies Patrick presents in every chapter, this book is a must read for every company executive, HR manager or recruiter who is serious about getting it right the first time, every time. Perhaps the most significant feature of this book is how the author places the reader right in the middle of ‘Smart Talent Management’ through his artful use of questions. You don’t just read this book, you experience it and it is an experience I highly recommend. This author and publication have my highest endorsement for applicable information and implementable process content. We are what we repeatedly do, excellence then is not an act, but a habit. If it goes bad, I did it. If it goes semi-good, we did it. If it goes really good, then you did it. That’s what it takes for people to win for you. Find a job you like and you add five days to every week. The spirit, the will to win, and the will to excel are the things that endure. These qualities are so much more important than the events that occur. Failure is the opportunity to begin again, more intelligently. Success provides the opportunity to continuously improve. Life is short…so where ever you are - be THERE… Be focused and be present. I think one lesson I have learned is that there is no substitute for paying attention. When I started here as CEO, someone gave me a conductor’s baton. I see it as symbolic to what I do here every day. A bad conductor can ruin even the most talented orchestra, but a good conductor can get everyone playing from the same sheet of music. If you look at any business that’s consistently successful, you’ll find that its leaders focus intensely and relentlessly on people selection. Whether you’re the head of a multi-million dollar corporation or in charge of your first profit center, you cannot delegate the process for selecting and developing leaders. It’s a job you have to love doing. Leaders who win the respect of others are the ones who deliver more than they promise, not the ones who promise more than they can deliver. The definition of insanity is doing the same thing over and over and expecting different results. Leaders are like eagles: They don’t flock; you find them one at a time. If you are part of recruiting management at an organization that has been facing continuous talent shortages, it’s time to get out of that rut and focus your resources on the areas that can have the highest business impact. Almost universally, that means shifting your recruiting talent, time, and budget towards the programs that will have the most impact, starting with employment branding (other high-impact programs include employee referrals, professional event recruiting, prioritizing jobs, bringing back key former employees (boomerangs), and making your corporate careers page compelling). Yes, I know it’s hard to find the time to step back from fighting fires but, at some point, you have to realize that you can’t just talk about being strategic. You have to act strategically by investing in the only long-term recruiting strategy that’s available—employment branding. There are no inferior jobs in any organization. No matter what the assigned task, if it is done well and with dignity, it contributes to the function of everything around it and should be valued accordingly by all. You can have brilliant ideas, but if you can’t get them across, your ideas won’t get you anywhere. Make it simple. Make it memorable. Make it inviting to look at. Make it fun to read…Advertising says to people, ‘Here’s what we’ve got. Here’s what it will do for you. Here’s how to get it. Inventor of the light bulb (after 1,000 separate attempts). If there is a way to do it better, find it. If each of us hires people who are smaller than we are, we shall become a company of dwarfs. But if each of us hires people who are bigger than we are, we shall become a company of giants. Nothing matters more in winning than getting the right people on the field. All the clever strategies and advanced technologies in the world are nowhere near as effective without great people to put them to work. The most important decisions that business people make are not what decisions, but who decisions. I am convinced that nothing we do is more important than hiring and developing people. At the end of the day you bet on people, not on strategies.